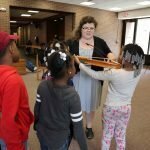 LD Steps Out with a free family-friendly performance of medieval music presented at Jefferson Branch Library in partnership with the Cleveland Public Library. Grab a seat – or on a spot on the floor – and enjoy this introduction to medieval songs and instruments! Featuring music and instruments from the 1300 and 1400s(!) performed by Elena Mullins (soprano & percussion), Allison Monroe (vielle & voice), and Debra Nagy (medieval winds, harp, and voice).